Just finished eating this for dinner. Oh. My. Goodness…it was amazing! It was one of those recipes that I just kind of “threw together” (Paula Deen, who?) and if I had known how delish this was, I would have taken more pictures..sorry! It’s a very sweet dish, but packed with veggies! Plus it has bacon…ANYTHING is good with bacon! Sorry I don’t have a better picture…but it is SOOOOO yummy, I promise. 1. Start by cooking the bacon to a reasonable crisp, remove from pan, and crumble. Drain half of the grease and leave the other half in the pan. 2. Place chopped up sweet potatoes in the pan and cover, stirring every so often. 3. After about 7 minutes place onion, peppers, zucchini, 1/4 teaspoon salt (optional), 1/2 teaspoon pepper, 1 teaspoon garlic powder, 1/2 teaspoon oregano, and a dash of red chili flakes. Stir and cover on med/ low heat until all veggies are soft and cooked down. 4. While the veggies are cooking, cut the apples into chunks, prepare the spinach onto plates, and whisk together all ingredients for the dressing. 5. 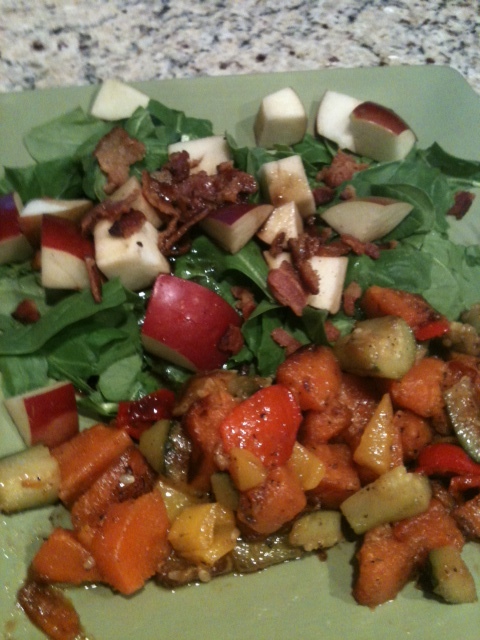 Top spinach with apple chunks and crumbled baco. 6. When veggies are done, plate them right next to the salad. 7. Just before serving, drizzle the dressing over everything.